Diagnosed with incurable prostate cancer in November 2014 and told he could have as little as two years left to live, the remarkable Webber has raised thousands for the charity in a series of epic endurance events and in the build-up to Non-League Day he walked more than 180 miles from Blyth Spartans to FC Halifax Town. 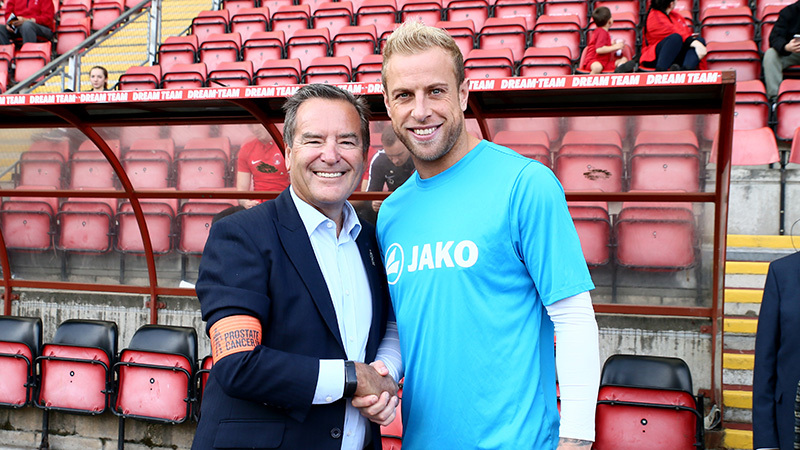 In total, he visited 10 National League clubs, hand-delivering unique captains’ armbands to be worn by all MANarama teams on Non-League Day.The bright orange band, which includes the iconic Prostate Cancer UK logo, illustrated the clubs’ united stand against the most common cancer in men. As the number of men diagnosed with prostate cancer continues to rise (making it the most common of all cancers by 2030), now is the time to take control. Through shifting the science over the next 10 years to focus on radical improvements in diagnosis, treatment, prevention, and support, we will stop prostate cancer being a killer. More than 11,000 men die from prostate cancer in the UK each year – that’s one man every 45 minutes. It’s the third biggest cancer killer. Prostate cancer is set to become the most commonly diagnosed cancer of all in the UK by 2030 – which is why we must all act now to curb its power to kill. Anyone with concerns about prostate cancer may contact Prostate Cancer UK’s Specialist Nurses in confidence on 0800 074 8383 or online via the Live Chat instant messaging service: www.prostatecanceruk.org/. The Specialist Nurse phone service is free to landlines and open from 9am to 6pm Monday to Friday with late opening until 8pm on Wednesdays. Kevin’s March for Men saw him head from Blyth Spartans to Gateshead on the opening day, before walking from the Gateshead International Stadium to Hartlepool United on Monday, October 8th. The following day he headed from Victoria Park to Spennymoor Town, and then on to Darlington. He broke through the 100-mile barrier the following day and on Thursday headed to York City and Harrogate Town. His penultimate trek, on Friday, October 12th, took him from Harrogate to Guiseley AFC. And on Non-League Day he left Nethermoor Park and reached Bradford Park Avenue ahead of their 3pm kick off against Kidderminster Harriers. The final leg took him to The Shay ahead of the teatime clash against Chesterfield. 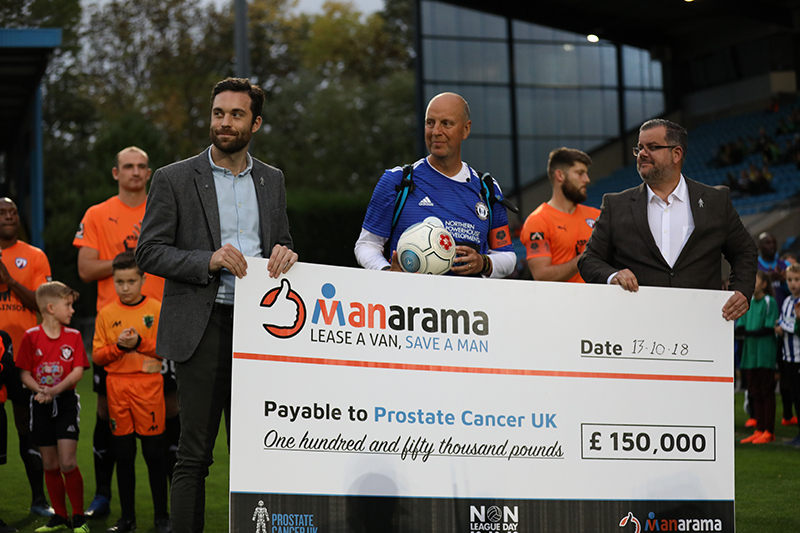 Vanarama, is an award-winning commercial and personal vehicle leasing company established by CEO Andy Alderson in 2004 with a team of just three people – the company now employs over 200 people at its Hemel Hempstead main office. The company provides industry-leading customer service and has found investing in that service, and the staff that provide it, to be a successful formula for success. Vanarama is also is a member of the Institute of Customer Service and was awarded a ServiceMark with distinction in 2017. Established in 1979, the National League consists of 68 clubs in 3 divisions occupying the fifth and sixth tiers of English football. The top division promotes two clubs directly each season into the EFL and all 68 clubs participate annually in the FA Cup and FA Trophy. The National League Promotion Final is played annually at Wembley Stadium. Clubs within the National League play entertaining and competitive football in front of loyal and passionate fans.